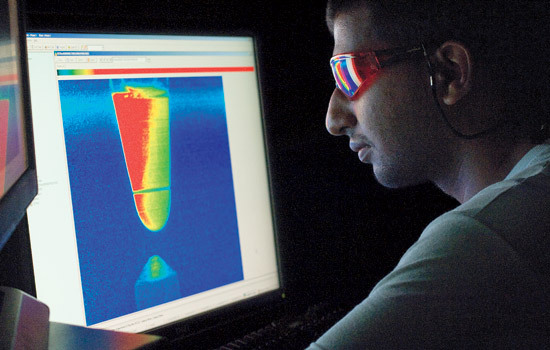 Amit Chainani, a graduate student in the Kate Gleason College of Engineering, reviews data collected during the experimental mixing process done in microwells, cone-shaped plastic cups within blood-analyzer machines. Research being done on the blood analyzers will improve indicators of infection or disease. Advances in medical diagnostics offer great potential for improving patient care. Three RIT projects, which are among the first to be completed as part of the university’s corporate research-and-development venture known as Corporate R&D at RIT, are positioned to make an impact in that area. Each of these medical-technology projects provides a means for improving the performance of blood analysis equipment on platforms that are scalable, modular and user-friendly—bringing CSI-like discovery to the growing line of RIT’s research-and-development projects. Kathleen Lamkin-Kennard, Eli Saber and Steven Day, all faculty members in the Kate Gleason College of Engineering, were awarded research funding totaling $160,000 for separate projects with Ortho Clinical Diagnostics. The company, a local subsidiary of Johnson & Johnson, is one of the first organizations to partner with RIT in the program. Lamkin-Kennard and Luke Holsen, a third-year biomedical engineering student, developed modular software for simulating antibody/antigen reactions. “The blood analyzer is used in clinical labs in hospitals and medical offices,” explains Lamkin-Kennard, assistant professor in the mechanical engineering department. “Companies continually look to improve analysis machines. Current analyzers calculate dozens of chemical reactions. What seems like a simple compound may not always be, and we need to understand the fundamental reactions going on.” Ortho Clinical Diagnostics is based in Raritan, N.J., but has both manufacturing and R&D operations in Rochester. The company develops specialized in-vitro diagnostic equipment used to test blood and other bio-fluids in transfusion medicine and clinical laboratories. Since the results produced by this equipment are used for important medical decisions, improvements in accuracy and reliability of those results are always desired. “More accurate reading of data can ensure better determination of disease and eventual intervention,” says Namitha Benjamin, an electrical engineering graduate student who worked with Eli Saber, associate professor in electrical engineering. Saber and Benjamin developed algorithms for interpreting thin-film slides to improve the efficiency and accuracy of tests to detect glucose levels for patients with, or suspected of having, diabetes. The project uses slides to build an image database that shows results to the lowest and highest extremes of the normalcy scale and to determine even finer measures within the current results.